Calling all mummies and daddies! Mark your calendars and join The Safe Seat at our roving booths for the next 2 months! From 12 January to 24 February, we have a whole line-up of activities planned, every weekend, especially for you. 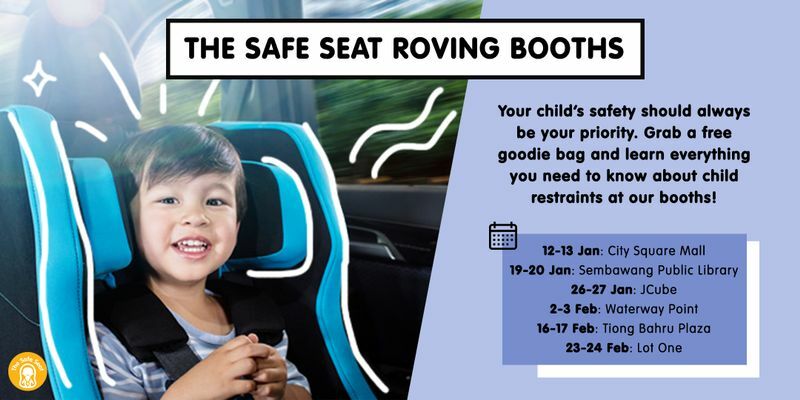 Come aboard our campaign as we raise awareness about child restraints (child seats and booster seats) and child passenger safety as well as share about the importance of using them. Better yet, learn more about how you can keep your child safe on the roads at our booths! For those who love freebies, free goodie bags, jam-packed with exciting gifts, will be given out (while stocks last) at our booths! Think products from child restraint brands such as Taxi Baby and Mothercare, local milk powder brand Einmilk and household products from Darlie, and many many more.